Possibly you are thinking that quite complicated system is involved in the DIY Project. Heavy Indian Brass Bells Used For Worship Can Be Shaken By Mechanical System Controlled By Arduino. Arduino Brass Bell Ringing DIY is Simple. We just need thick wire, bell, wire cutter, plier, servo motor in most simplest form. Coding part is also easy. It is better to use PAPERduino like cheaper thing instead of Arduino for real usage. You can use this Arduino Bell as door bell, as an idea. More bigger the bell will be, more will be the sound. One Servo Motor like TowerPro SG 5010. Basically we ring the hand bells or any bells in simple harmonic motion like pendulum. Servo motors are great for creation of this simple harmonic motion. So, the coding part is just easy. If you are not used with Servo Motor basics to control with Arduino, please read Servo Motor control by Arduino. We also have Servo Motor buying guide. That int pulse = 1500 value is in microseconds. 5V for 1500 microseconds (1.5 milliseconds) corresponds to 90 degrees. 500 microseconds corresponds to 0 degrees and 2500 microseconds corresponds to 180 degrees. delay(20) means send pulse every 20ms. Because hitting or moving the bell once will create reset of the position by gravity – it is easy than you can think. Managing the mechanical system is difficult – we created the infographics on what others are doing with their bells to give you an idea. This Article Has Been Shared 2929 Times! Hardening WordPress Written on Official WordPress is Pretty Outdated & Useless on 2015. Here is Some Tips For WordPress Running on Nginx on OpenStack. 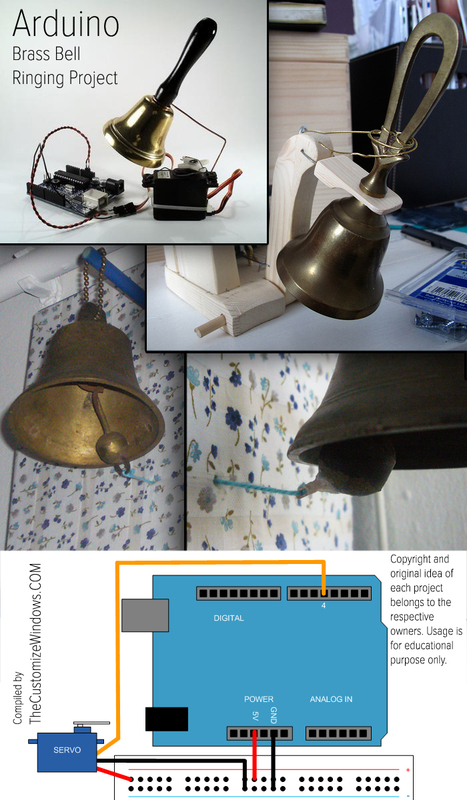 Cite this article as: Abhishek Ghosh, "Arduino Bell : Brass Bell Ringing DIY Project," in The Customize Windows, September 14, 2016, April 23, 2019, https://thecustomizewindows.com/2016/09/arduino-bell-brass-bell-ringing-diy-project/.